After so many years of not winning the state championship, St. Thomas More Head Coach Jim Hightower finally won his first championship for the program after losing the year before to Parkview. Nate Cox and the short, but quick passing attack for the Cougars was really effective against the Parkview Baptist secondary in the rematch, but it was having big #99 back on defense, in St. Thomas More DT Hunter Clay, that made all the difference. Clay had a tough junior year as he tore his ACL and missed most of that season including the state championship loss. However, this year was different. Clay was healthy and had a great senior season as the interior presence on the defensive line. The offense was getting hot come playoff time, but so was the defensive line with the likes of the two Hunters wrecking havoc on the defensive line. Those two are Hunter Clay and defensive end Hunter Bergeron. They did wreck just enough havoc on Parkview Baptists’ offense early in the game, and that was all they needed to do as the offense took over. Clay responded to adversity really well and was a vocal leader for the junior year. He never quit and came back for his senior season where he was one of the team’s best players on their championship run. Clay even played on offense as a fullback in short yard situations. It is incredible that a high school kid like Hunter Clay used a negative like a torn ACL as a positive to come back the following year and help lead a school to their first state championship. That is the stuff that you see in the movies! On National Signing Day, Hunter Clay signed with the Southern Jaguars to continue his young and promising career. Our own Alex Martin caught up with the Southern commit to talk about his career and so much more in today’s recruiting spotlight! LAFM: What are some of your accomplishments at St. Thomas More? Winning a state championship and being voted as the team captain by my teammates are my biggest accomplishments while at St. Thomas More. LAFM: Who was the toughest offensive lineman that you faced this year? LAFM: What are your strengths as a defensive tackle? My get off, leverage, hands, and strength are the best parts to my game. LAFM: What is your favorite pre-game meal? LAFM: Do you have any pre-game rituals? I like to listen to music, pray, and then go throw some hand drills. LAFM: Who is your favorite music artist that you like to listen to before a game? 21 Savage is my favorite to listen to before a game. LAFM: What do you do when the football season is over? I like to workout and throw the discus. Aaron Donald (former Pittsburgh Panther and current Los Angeles Rams DT) because I think that we do the same things. LAFM: Is there anybody in your family that has played high school, college, or even pro? Nobody has played any high school or college sports in my family. I actually have my own clothing line 99 Supply. I am president of the STM Fishing Club, and I am about to be an Eagle Scout. I would like to thank my family, my teammates, my coaches, and all my teachers. LAFM: What separates yourself from any other defensive lineman in the state? What separates me from every defensive lineman in the state is my hands, my drive, my football I.Q. and motivation. LAFM: Is there anybody that you want to give a shout out to? 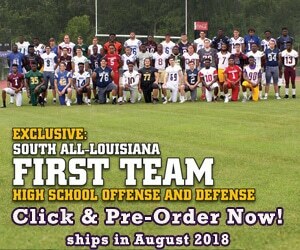 I like to give a shout out to Cheenech, STM football, Shane Vallot, Ziyon Hill, Dylan Lewis, Bralen Trahan, Dell, Kyle Pierre, and Big Ken. Previous: Signing Day at Landry Walker High School!